Crafting Adventures: Sunday's with Crissy - Guest Designer! Crissy's first challenge calls for you to make a combo. Now, you can combine anything - techniques, images, embellishments... you get the idea. Anyway, my combo is that I have combined 2 DP's and have added some doodling around the edge of my digi image. Not too adventurous I know but the image was too cute to clutter! I suppose I have also combined two challenges as well though - Sundays with Crissy and Our Creative Challenge where the theme this week is bows. 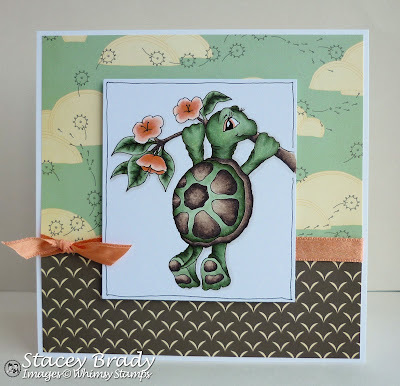 Digi Stamps: Hang in There, available here at Whimsy Stamps from Monday 12 April. Paper: 'Earth Love' by Cosmo Cricket. Copic Markers: R20, R22, E43, E47, E49, G21, G85, G99, W1, W3, W5, W7. Tools & Embellishments: Ribbon from stash. BTW, you have a a fortnight to make something gorgeous (rules on the challenge blog) and get it posted online. You really are going to want to make an effort too as one lucky winner is going to win 15 delicious Copic Markers! Make sure you join me again tomorrow when we will be showcasing yet more of Whimsy new digital images in a fun filled Whimsy blog hop! How adorable is he?!?! I love the card and combination of DP papers. I think you're right about not needing to clutter the card as it works brilliantly on it's own! Your colouring is spectacular! This is a darling card! Thank-you so much for playing along with us on the OCC this week! This is adorable! Thanks for playing along with Our Creative Corner this week! This is so adorable Stacey!! fabulous coloring! Oh this is so sweet!! Love your dp and your coloring!! Great combo of colors and papers!! Awesome job on Crissy's challenge. See you at the hop tomorrow!! This is beautiful!! I just love how you colored the turtle and your choice of dp!! Great combo of challenges and a stunning take on Crissy's challenge!! See you at the hop!! Totally adorable!! Thanks for playing along at Our Creative Corner this week!